Another in my Roman Holidays series of bracelets, Ceres honors the Roman goddess of the harvest with autumn colors: ivory glass pearls, brecciated jasper and serpentine jade rounds, and Swarovski® crystal bicones in Peridot AB, Sunflower, and Hyacinth. Another in the Roman Holidays series… this time with white glass pearls, snowflake obsidian rounds, black cat’s eye beads, and Jet Swarovski® crystals. Made this as a graduation gift for my sister. She graduated from UofL’s Brandeis School of Law; the fleur-de-lis for the city of Louisville, and red and black are the university’s colors. There’s a “2011” charm and a grad cap charm, which should be self-evident. The shark is pretty obvious, too and the bird is a “legal eagle”. 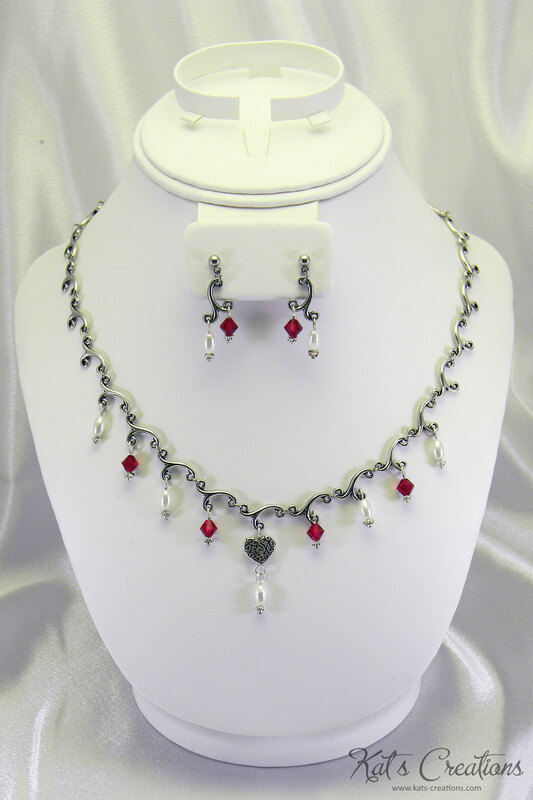 Features Byzantine weave chain maille using silver and gunmetal jump rings, and Swarovski® crystal bicones in siam and jet. Custom item; not for sale. 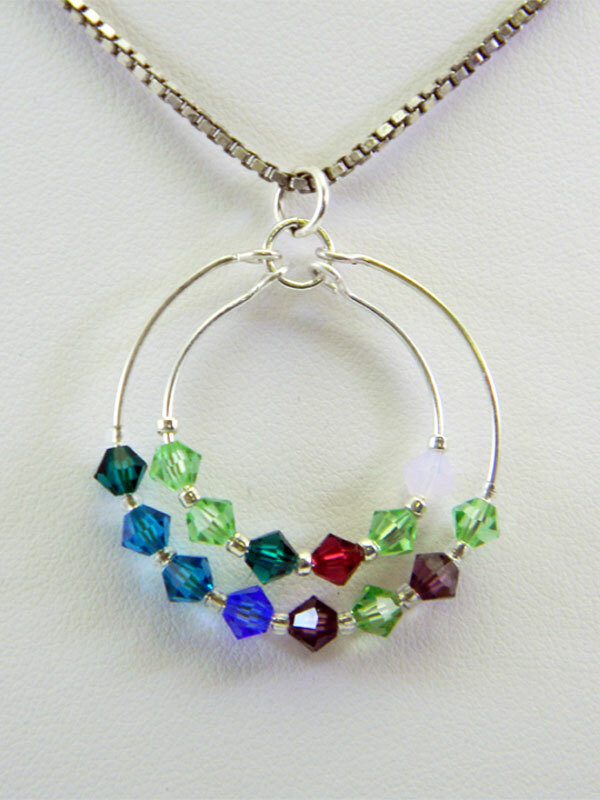 This pendant was originally created as a Mother’s Day gift for my own mom, and features the Swarovski® birthstones—in chronological order by age—of her eight children (outer ring) and six grandchildren (inner ring). When this piece was originally made, there were only three grandchildren. 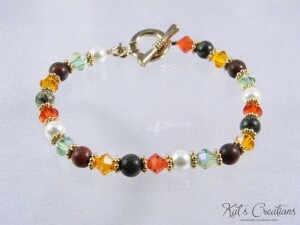 The simplicity of the design made it easy to add new birthstones as needed. Most people will likely need their children’s birthstones on the inner ring and grandchildren on the outer; that is easily done! 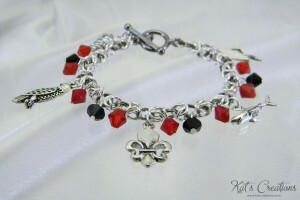 This is a custom order piece; please contact me for pricing options. 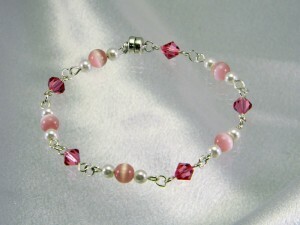 As your little princess grows, so will this bracelet! Based on my popular Venus/Cupid models, this bracelet features removable links to let it fit a smaller wrist, but which can be added back in as needed. 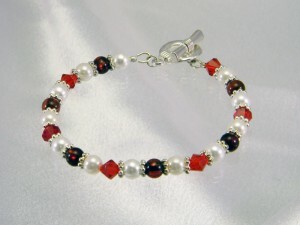 Also, the magnetic clasp is easy on little fingers. Not intended for children younger than three. 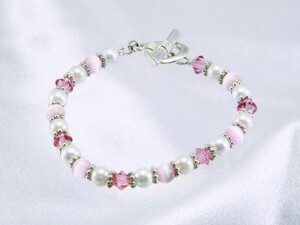 Because of the magnetic clasp, this bracelet should not be worn by anyone with a pacemaker. Based on a design from one of my favorite bead suppliers, eebeads.com, these antique copper, gold, or silver “melody” links form a uniquely beautiful chain. 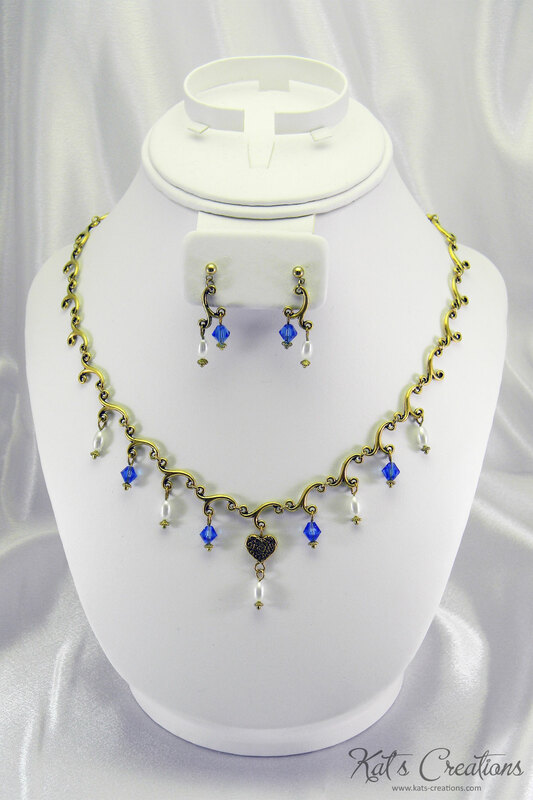 Embellished with rice-shaped glass pearls, Swarovski® crystals, and a single plated heart. 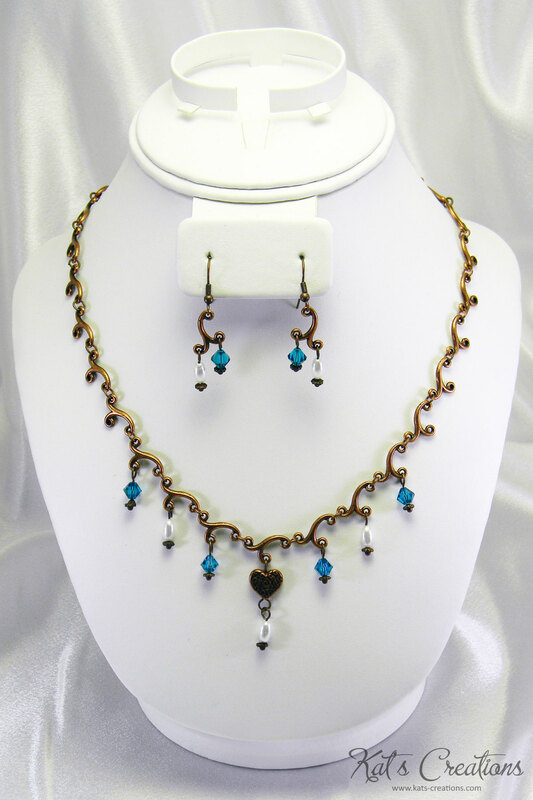 Want to make your necklace and earrings even more versatile? Purchase additional color sets for your chosen finish; simple instructions are included. 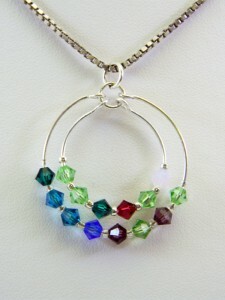 Don’t forget to leave a comment on your order, telling me what color of Swarovski® crystals you want! Moms-to-be, new mothers, long-time mothers, and mothers-of-the-heart, show off your love for your little one with this sparkling bracelet embellished with pastel Swarovski® crystals. 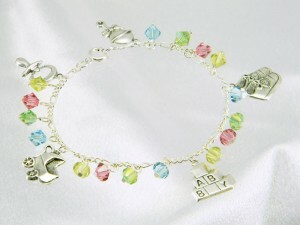 Charms are stamped, all silver pieces are silver-plate. Based on my popular Cupid design, this bracelet takes a very feminine turn with rose Swarovski® crystals and pink cats-eye beads. 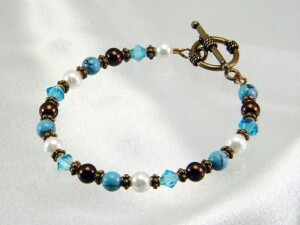 White and chocolate-colored glass pearls combine with aquamarine Swarovski® crystals, chalk turquoise rounds, and antique copper spacers to make an attractive bracelet suitable for dressing up casual attire or adding fun to formal wear. Sweet and sassy! 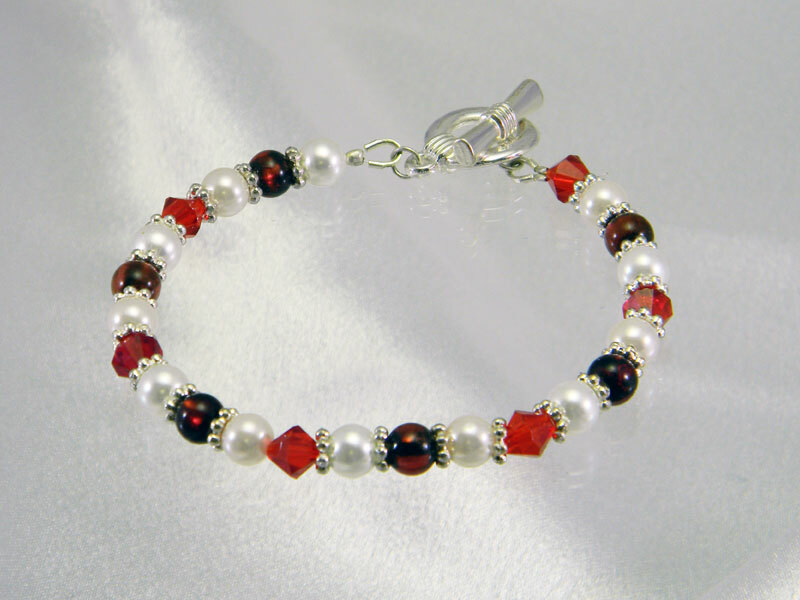 White and pink glass pearls add a gentle touch to the rich reds of light siam Swarovski® crystals and carnelian glass rounds. 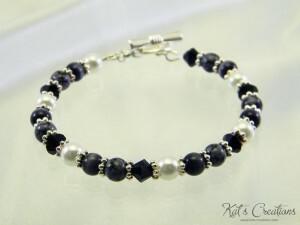 Silver-plate spacers provide some extra sparkle to this simple but elegant bracelet.